Mayor de Blasio promises to “do more” to clear drivers from bus lanes and to build more protected bike lanes, but stopped short of endorsing a bold (and expensive) initiative from the City Council’s transportation chief to create an entirely new police unit to enforce surface transit scofflaws and quadruple the mileage of safe routes for cyclists. 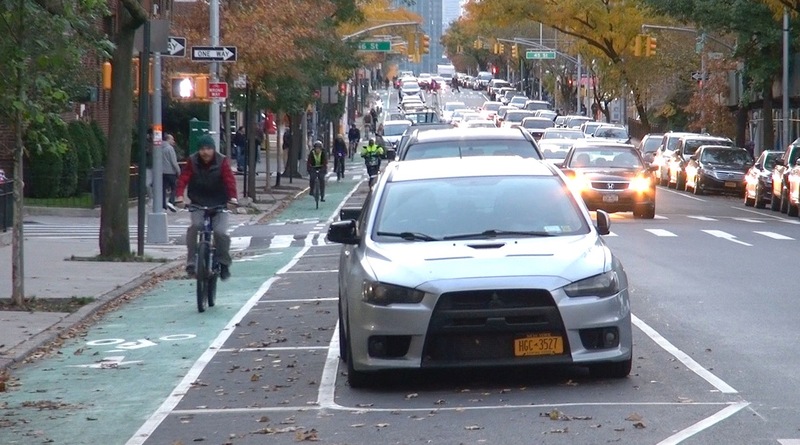 Council Member Ydanis Rodriguez called for the new bus lane enforcement unit on Tuesday, following up on his call last week for 100 miles of new protected bike lanes every year, but Hizzoner batted both proposals aside gently. “On the question of enforcement, I’ve said very publicly, we intend to do more and we need to do more on bus lane enforcement,” he said on Tuesday afternoon. 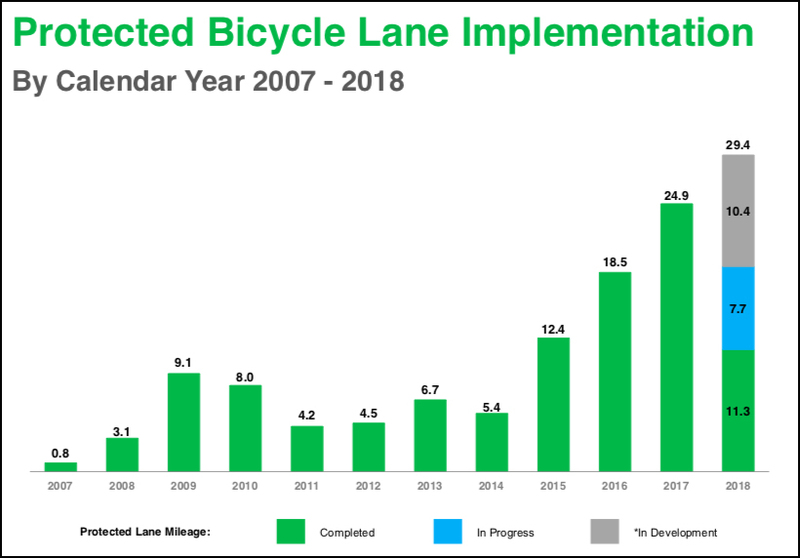 Pressed about building 100 miles of protected bike lanes — up from an average of about 25 per year, and growing slightly — the mayor defended his prior work. We need more of these, says Council Member Ydanis Rodriguez. Photo: Clarence Eckerson, Jr.
Rodriguez told Streetsblog he’ll keep fighting for more — part of his effort to rein in cars in a city that has become unlivable due to congestion and reckless drivers. Slow bus trips are part of the reason for the 21-percent decline in bus ridership since 2002. 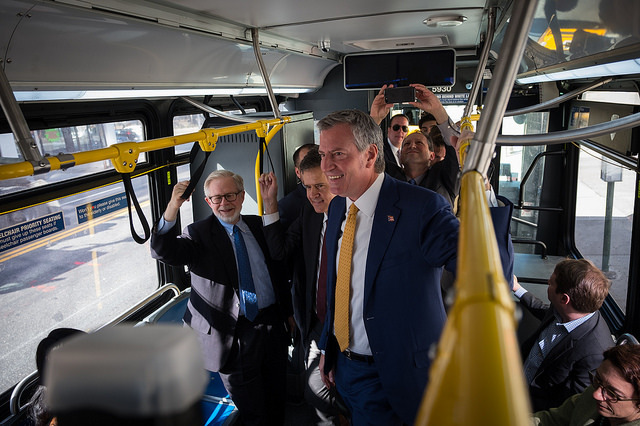 Buses in New York average only 7.4 miles per hour citywide — and are so low in congested areas that their speeds approach “the speed of humans’ prehistoric form of transportation: their feet,” in the words of a report by TransitCenter. In industry-leading Los Angeles — no stranger to congestion — the average bus goes 10.7 miles per hour, a big difference on a 10-mile route. That TransitCenter report strongly called for camera enforcement, not even mentioning hiring more humans to patrol bus lanes, partly because of the high cost and partly because of the inefficiency. This fall, the NYPD revealed that compared to last year, it had written three times more bus lane moving violations — 6,500 from January through September this year — and 1.5 times as many bus lane parking violations (roughly 22,300 this year). Yet overall bus speeds went up only .1 miles per hour. The reason? Experts say the number of tickets should be in the hundreds of thousands, not in the single-digit thousands. Rodriguez’s call for a bus lane enforcement team is an understandable reaction to two connected failures of city and state policy: the NYPD does not devote enough dedicated resources to bus lane enforcement and the state has not given the city the power to widely deploy cameras to enforce bus lane infractions. New York State allows the city to enforce bus lanes with cameras on only 15 Select Bus Service routes — and as a result, those SBS lines run at dramatically better speeds than regular buses or non-camera-enforced SBS routes. Overall, cameras do a far better job than police officers. New York’s speed zone cameras, for example, wrote more than 4.6 million summonses in four years, roughly ten times the amount written by the city’s police personnel over the same period. And cameras are far cheaper than cops. According to a thorough 2017 report by the National Capital Region Transportation Planning Board, the cost-benefit ratio of a regular white-striped bus lane with a bus-mounted camera is 2.6 times higher than a white-striped bus lane with maximum police enforcement effort. Plus, a bus-camera costs only $9.500 per bus up front, plus a nominal maintenance fee, while a dedicated bus-lane enforcement officer costs $50 per hour, or more than $82,000 per year. Enforcement cameras that are mounted along bus routes are more expensive up front, but still have a cost-benefit ratio about 1.6 times greater than hiring cops to write tickets. On the issue of protected bike lanes, Rodriguez said he was disappointed that the mayor’s construction of safe routes was not likely to expand into the triple digits annually. Rodriguez said it was not only about safety, but symbolism. “We want our city to be a more walkable one, so it’s our responsibility to have vision and a big goal,” he said. After this story was published, the NYPD responded. There are 3,400 traffic agents citywide, though none is specifically dedicated to bus lane enforcement. The agency is writing more tickets: From Jan. 1 to Oct. 31, the NYPD issued 6,918 bus lane moving violation summonses, up from just 1,762 over the same period last year, an increase of nearly 300 percent. The agency issued 26,554 bus lane parking tickets, up 54 percent from the same period last year. The vast majority of summonses — 237,828 this year — are for parking in bus stops. Those are up 9 percent this year. I’m all for bike lanes… I get everywhere by bike, after all. But the Rodriguez rhetoric falls a little flat here. How does adding bike lanes make the city more walkable — unless he intends them for pedestrians to walk in? (Yes I know, adding bike lanes results in fewer injuries for everyone, that is well documented). I think you answer your own question. Protected bike lanes calm traffic, shorten crossing distances, and significantly reduce pedestrian injuries. Being able to get where I’m walking in one piece certainly factors into how walkable I feel a place is. You miss my point. The number one reason to build bike lanes is to make it faster, easier and safer to get around by bike. Safety benefits for pedestrians and drivers are secondary effects. It would be nice if some politician would agree that biking is a good thing, and that’s why we make bike lanes. Painted bus lanes aren’t enough either. The center running bus lanes on East 161st St are devoid of stopped vehicles because they are located in the middle of the street. There’s also small sections of physical separation using plastic bollards, the concrete bus stop island, and underpass busway for all eastbound buses headed under the Grand Concourse. The only violators are emergency vehicles, which are passing through without stopping. The few others who mistakenly or purposely use the bus lanes in this section are fined by cameras, but drivers are well aware at this point and stay clear. The city needs physically separated bus lanes where applicable, including bus only busways (e.g. Fulton St/14th St during L train shutdown). “On the question of enforcement, I’ve said very publicly, we intend to do more and we need to do more on bus lane enforcement,” he said on Tuesday afternoon. He thinks that, if there are 10 cars parked in the bus lane today, and there are only 8 cars tomorrow, that he’s made a 20% improvement. In fact, he’s probably made a 0% improvement. Once the bus has to merge out of the bus lane into general traffic, it doesn’t make a difference if it has to pass 10 cars or only 8. For a bus lane to be effective, it needs to be absolutely clear of all vehicles other than buses. No placards, no police cars, no press, no running into the store for 5 minutes or stopping to pick up the kids. He needs to make it absolutely clear that the bus lane is for buses only, period. The only acceptable exception is an emergency response that requires the use of the bus lane (if a fire truck needs to block the bus lane in order to reach a hydrant, of course that’s fine). Every driver should realize that parking in the bus lane is no more acceptable than parking on the subway track. Bus lane violators are disproportionately city employees. While one could argue that enforcement for the general public might be difficult, it should be much easier for de Blasio to discipline his own employees. If he can’t even keep his own employees under control, this clearly isn’t a priority to him. Perhaps he could try getting around the city by transit from time to time. He’s not going to understand the travails of the bus rider if he never rides the bus himself. Keep sucking off that tailpipe DeBlasio. I watched multiple car service vehicle drive right past a cop car with its lights on to pull into, and wait at a bus stop just feet in front the the cop car. when a bus approached and had to discharge people in the middle of the street neither the car service drivers, nor the police did anything. There was plenty of good news this year. Here's the bad news.